Hannah Perrigin was crowned 2019 Most Beautiful last night at the 68th annual Parade of Beauties. For Perrigin, a junior exercise science major from Columbus, Mississippi, her victory didn’t mark the first time that she’d walked across the Gertrude C. Ford Center stage. She had competed two times prior. In her third pageant, she was victorious. While Perrigin has competed before, she said she still had some nerves. 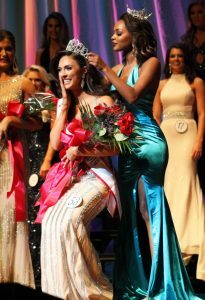 Ultimately, she said she was mostly excited because of how much she enjoyed meeting the 61 women who competed in the pageant. The contest was emceed by Asya Branch, Miss Mississippi and Most Beautiful 2018, and Blair Wortsmith, Miss University 2019. Eliza Williams, co-director of pageants for the Ole Miss Student Activities Association, said her favorite part of the whole experience was getting to know her committee, as well as all the contestants. “Just being able to give them that confidence that they need and reassure them that this pageant is about more than just being beautiful and walking around on stage — it’s got a lot more to it,” Williams said. Junior accounting major Rachel Avery has been to the last three Parade of Beauties pageants; however, this year’s was her favorite to date.